Hydroponics is not new. It goes back decades – even centuries – but it is new to me. I first learned about hydroponics through the Aerogarden and all-in-one systems like it. This cute little system could be used indoors, without dirt or sunlight. It seemed amazing, almost impossible actually. I was thinking about getting one, but the high price tag was a significant deterrent. I didn’t want to spend $80 (small LED system) to $180 (larger LED system) on what amounts to $5-$10 in vegetables and herbs. But as I was searching the Internet for bargains on the system, I learned that Hydroponics is actually not that expensive to do. The basics can be reduced to a simple container, water, some nutrients, a growing medium and a plant. After watching lots of YouTube videos, seeing fantastic contraptions constructed with PVC pipe, I decided to go with a simple Deep Water Culture (DWC) setup. Basically, it’s a bucket with bubbles. A fish tank aerator is used to oxygenate the water, which is filled with the right amount of nutrients. Some systems circulate the water. But in this setup, it’s less complicated. But even though this system is less complicated, I still needed to order the parts. 4 Site Deep Water Culture Vegetative Bubbler System ($38.47) – I probably could have gone with something cheaper, but this kit included almost everything I needed to experiment with Hydroponics. It includes 4 net cups, a 5 gallon bucket, air pump, air hose and air stone. I ordered this through Amazon, so I’m not sure if the grow rocks and pH test kit are included. General Hydroponics MaxiGro for Gardening, 2.2-Pound ($15.34) – It seems that lettuce is easy to grow with Hydroponics. So far, that seems to be true. I was able to save on nutrients. 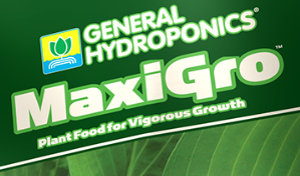 Since I’m planning to grow lettuce, I only need the first half of the MaxiGro / MaxiBloom combo. (MaxiBloom is for flowering plants.) If this works, I’ll likely try growing tomatoes next and will probably use MaxiBloom too. OxyLED Hydroponic LED Plant Grow Lights, 12W, 12 LEDs, 3 Blue/9 Red ($19.61 x2) – While Spring is here, and there’s lots of sunshine outside, a parameter of this experiment is to test year-round growing. I got two bulbs because one light didn’t seem to be enough illumination. The AeroGardens have great lights. The LEDs in those high-end systems (7-9 pods) are around 20-45 watts of power. So, this setup should be similar in strength. If I need more power, I can just add more lights. 12′ Hanging Lantern Cord with On/Off Switch ($6.12 x2) – While the grow lights are standard E26 bulbs, I needed fixtures to use them. I decided to go with hanging cords. That way, I could easily raise or lower the lights as needed. GE 15075 24 Hour 2 Outlet Indoor Heavy Duty On/Off Timer, White ($10.97) – The lights shouldn’t be on all of the time, so I added a timer to the shopping list. It has two outlets, so that is sufficient for this experiment. Adding that up, it’s $116.24 + $10.30 in tax. That’s some pretty expensive lettuce.